BeNotForgot.com: 1930 on Lynn Blvd. 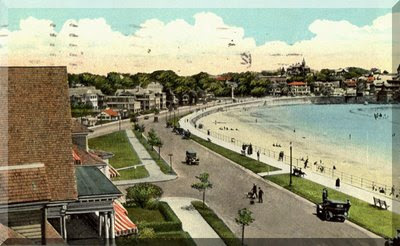 The above collage includes an actual postcard showing a birds-eye view of Lynn Shore Drive, Lynn, Mass. The comment about the outing in the new carriage is an actual entry in the baby book of Robert E. Henry, Jr. (1930-1997) -- aka Uncle Bob. 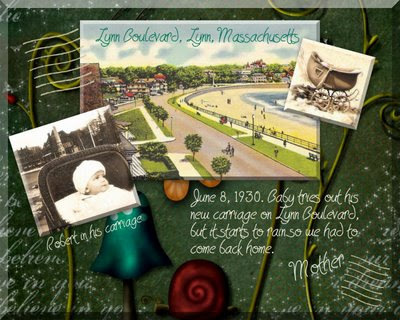 And the snapshot of the carriage on the upper right is clipped from one of the family photos on Lynn Beach. I chose the green premade template for the background as representative of Uncle Bob's birthstone -- the emerald -- for the month of May. If you look at the snapshot of Uncle Bob in the lower left corner of the collage, you will notice what appears to be a monument of some sort directly behind his head. Then if you peer closely at the two postcards, you will be able to make out what might be the same monument situated just around the upper curve on Lynn Blvd. or Lynn Shore Dr. Does anybody know what that monument is? Or exactly where on Lynn Shore Drive that might be? The above postcard is another version of the postcard used in the above collage. I am assuming that this is the original photo from which the postcard used in the collage was created. How totally wonderful! Thank you for pointing out that wonderful detail stuff! WOW what a wonderful postcard. I so enjoyed all the cool background details. I love the family connection, the person with the place shown on the card. Wonderful. Great post and love the card. Difficult to say from a hundred year old view where this is. But if I had to guess, the intersection looks like where Lynn Shore Drive merges into what's now Route 129, which means the view is facing Swampscott, and which would make the obelisk the Civil War Monument at Monument Square, where Route 129 meets Monument Avenue. Like Johnny Cash, I've been everywhere, man. An interesting bit of family history. Another beautiful collage and wonderful postcard selection! Happy PFF! Check out this page if you haven't already. It sure looks like the monument the baby is in front of. I followed the suggestion by Chris Overstreet when he said it might be the Civil War Monument there. What do you think? Let me know. I love to search for things! What a beautiful collage! Sometimes it's the pictures [and not the words] that tell the story, and you do it in such a beautiful way. Memorial Day greetings to y'all -- the 3-day weekend version, that is. I'll post a relevant postcard next Friday, which is closer to the original version of Memorial / Decoration Day -- the 30th of May. Much appreciation to the guy from Georgia -- Chris Overstreet -- who was reading here and is actually familiar with Lynn Blvd. and took the time to point me in the right direction! And thanks to my fellow Texan, Judy, for doing that research for me -- you did good! I like to consider myself a P.I. 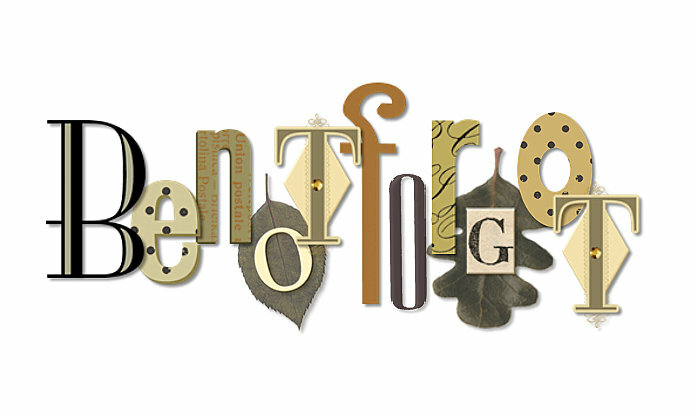 in the genealogy world -- you seem to be the same! Glad y'all stopped by. I will follow up with a few tidbits about "the monument." In 1883, a Soldier's Monument was erected in Monument Square, formerly Mudge's Square, directly in front of the Mudge estate, the land being given to the town for that purpose by the Mudge heirs. The monument is of granite, with bronze trimmings & bronze tablets. Its height is 30' from the ground, with a base 6'10" square. The 4 dies or tablets are 3'6" square (bronze). The front tablet, facing the Mudge estate, contains the inscriptions; on the opposite side is the date of erection; on the 2 other sides are the names of the 14 soldiers to whose memory the monument is erected. On the 1st section of the shaft are 4 bronze bas-reliefs -- on the front the U.S. coat of arms; on the opposite side a soldier & sailor; on the right a representation of cavalry, & on the left a representation of artillery. Above this is a bronze wreath. The shaft is square, with a plain, pointed top. The monument, which cost $2943.10, was dedicated in 1883. Wordless Wednesday :: Mitten Kittens!